They are found in the cytoplasmic matrix of all eukaryotic cell, organelles like cilia, flagella etc but absent in prokaryotic cell (except Anabaena), Amoeba and Slime moulds etc. 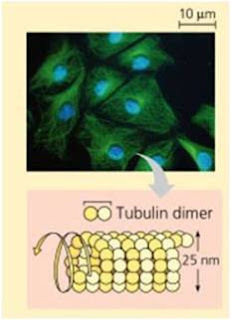 The microtubules are hollow unbranched cylindrical, 25 nm wide and 0.2 -25um long. They may mainly occur singly or in bundles and radiate from the centrioles to the periphery of the cell. The wall of a microtubule is composed of 13 parallel protofilaments that enclose a central lumen about 150 A0 wide. Each protofilaments is made up of a row of globular subunits formed mainly of protein tubulin, each contains one alpha-tubulin molecule and one beta-tubulin molecule. Microtubules are absent in prokaryotes. What are microtubule associated proteins(MAPs)? Both the classes of proteins have two domains one binds to microtubules and the other binds to other cell components. What are microtubule organising centres (MTOCs)? In animal cells, centrosomes are also called MTOCs. It is the site where microtubules are produced. Centrosome has a pair of small organelles called centrioles, each made up of a ring of nine groups of microtubules. During cell division, centrosome divides and centrioles replicates resulting in two centrosomes with its own centrioles. Centrsome moves opposite to the nucleus. From each centrosome, microtubules grow into a spindle which separates replicated chromosomes into 2 daughter cells. They form the motile elements of cilia and flagella, form spindle in cell division and movement of chromosomes during anaphase and pigment granules in the chromatophores. They control orientation of the cellulose microfibrils in the plant cell wall. They serve as tracks for the oriented support of macromolecules and organelles and play a role in cell differentiation and in the determination of polarity of the cell. Microtubule is an important target for anti cancer drugs, why? The drug Colchicine inhibits the polymerisation of microtubules, thus blocking the cell processes such as cell division that depend on functioning microtubules. Colchicine is used for inducing polyploidy in cultured cells. Taxol, stabilizes tubulin in microtubules and promotes polymerisation. Taxol is used as anticancer drug since it blocks the proliferation of rapidly dividing cells by interfering with the mitotic spindle.